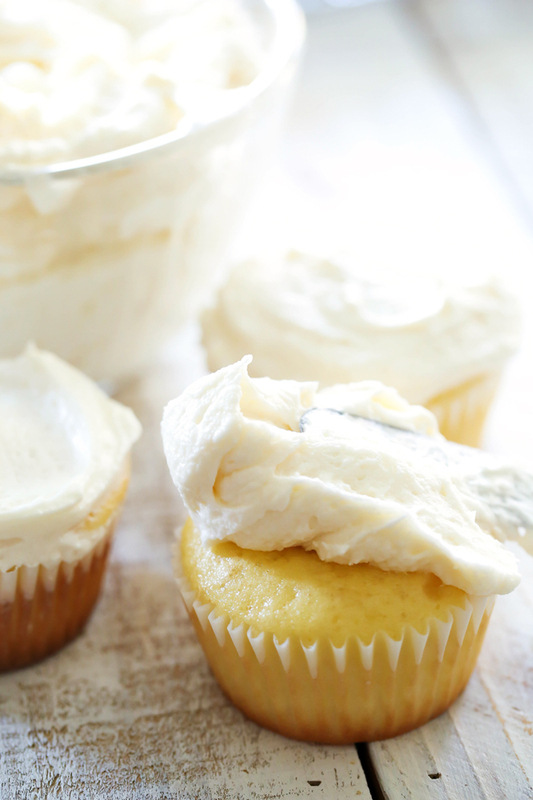 This Classic Buttercream Frosting recipe is perfection! Perfect consistency and perfect flavor! 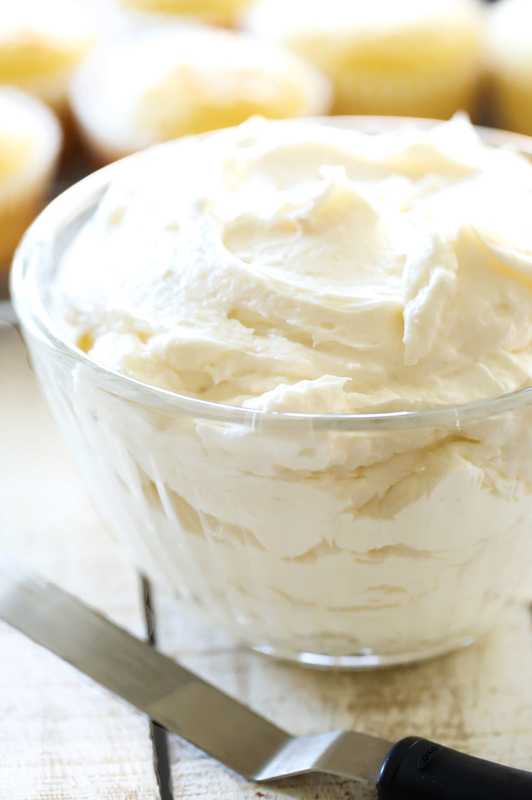 This is my go-to frosting recipe! The other day, my uncle called looking for a good buttercream recipe. I thought to myself, how do I not have just a basic buttercream recipe on my blog?! That is a huge oversight. So here you have it. My go to Buttercream Recipe and it is PERFECTION! It is light, fluffy and tastes WONDERFUL! In a medium bowl combine butter, powdered sugar, vanilla, cream/milk and salt and beat for 5 to 7 minutes until light and fluffy. Add more powdered sugar as needed for thicker frosting. Add cream/milk, a little at a time, to thin frosting. If you are frosting cookies or a cake use less powdered sugar. If you are using the frosting to decorate use more powdered sugar for a stiffer frosting. I can always use another frosting recipe cause, you know, that's the BEST part of eating cake! This looks delicious! How can i make my buttercream appear as white as yours? Is vegetable shortening an option and if so how much would i need to use? I use Bulgarian style buttermilk to thin my Buttercream Frosting. Helps to cut the sweetness and give it a wonderful flavor. If I am using buttercream for decorating a wedding or birthday cake, I use half butter and half Crisco. It holds up better. When you say mix it in a med size bowl...... You mean use bowl n whisk? OR you mean-use the mixer to make this good frosting??? My frosting never got light and fluffy. I slowly added more powdered sugar but it made it more runny. I not have it in the fridge hoping it will harden enough to frost my cupcakes...any advice? did you add to much milk? Was your butter melted completely? It should have only been softened to room temperature. Did you beat your butter for a few minutes to get it light and fluffy before adding the rest of the ingredients? Great recipe! Does it need to sit on the fridge afterwards? And after decorating my cupcakes with The frosting, do they need Cold? How long till for the frosting to turn bad? I actually freeze what I have left over of this recipe. It was in the freezer for about 4 months before I needed to use it again and was just as good. I let it thaw then put in a bowl and mixed it again real quick. I'm make Easter cupcakes for my sons class and I plan to double the recipe up and freeze more of it for use later on. Made it this past weekend, followed directions perfectly. It is so heavy! Even though it is butter, it really tastes like it was made with a large dose of Crisco. While some may enjoy this, it would be best with a richer flavor of chocolate, be it cake or cupcakes.And applied with a limited amount. How much does this recipe make? I need to ice a four tier cake that I'll cover with fondant and don't know how many of these recipes I would need to make. WOW! So good. I used half and half instead of milk or cream by itself. The frosting came out perfect. Thanks for sharing the recipe!!!! Does this recipe use salted or unsalted butter? unsalted butter, cause you are already adding salt to the recipe. I used salted and it was amazing. I still used the salt. Just delicious! Can you use the same recipe and and chocolate? Can you leave this out overnight, say under fondant? Is real butter best, or is margarine ok? How many does this make? How do you adapt it for chocolate buttercream? I am making this ahead of time. Will it keep in the fridge...how long? About how much does this yield? Such as 24 cupcakes? Two tier cake? Etc.. I am going to use it for,cookies,can I put them in the freezer for few days? I will be trying this today and send pics thansk so much? Without a doubt the best buttercream ever. I've never really liked it until this!!! Thank you sooooo much for sharing! Do you have a chocolate buttercream recipe??? Yes I do :) Thanks so much! This is the best ever. I've never really liked buttercream much until this!!! Do you have a chocolate buttercream recipe?? Thanks for sharing! Totally by surprise I came upon a delicious icing using this recipe. I realized I didn't have cream and personally don't care to use milk. So I thought what the heck its for the grandkids heart shaped cupcakes, I added french vanilla creamer for coffee, It's unbelievable, I got so excited I made another cake just so I could use the creamer. Give it a try and hope you enjoy as much as I have. I used your buttercream recipe and it was fantastic. Instead of using vanilla I used cottoncandy oil. Turn out great, texture was perfect but I was disappointed in the cottoncandy oil flavoring. This really is the BEST icing I have made. I didn't add the salt at first since I used salted butter, but it tasted a little too sweet for my liking so I added the 1/4 tsp of salt and it tastes perfect! While my frosting came out very good, I felt that it still have a very pure butter taste to it. What should I tweak? How many cupcakes will this ice??? Yummmmmm! I used this recipe on a cake I did for a baby shower and it was awesome! I did however use hazelnut creamer instead of cream with a touch of heavy whipping cream. I also used almond extract instead of vanilla extract. It whipped up nicely and tasted so delicious! This will definitely be a go-to recipe for me! Amazing!! I only used 4 cups powdered sugar and put it on cupcakes. It wasn't overly sweet. It frosted 30 cupcakes. I did beat butter first before adding other ingredients. It's very creamy with delicious flavor. My new go to recipe! I found myself eating it off of a spoon without the cupcake! This turned out absolutely perfect; then I added plant based coloring for my daughter's birthday & this am it's hard as a Rock. Hopefully adding more liquid will bring it back to its original consistency:(. I made this icing tonight. It was so good . Thank you for the awesome recipe . So good!!! I recommend using 1/2 tsp more of vanilla, only 4 cups of powdered sugar, and if u want it to taste a little like chocolate add 3 tbsp of cocoa powder. I just made this frosting and it is separating and watery, do I just keep adding powder sugar? I halved this recipe as I had 20 cupcakes to do. I did use the entire teaspoon of vanilla though. This recipe is so easy and yummy. I think the heavy cream made it luscious. I will make it many more times I am sure. Thanks for sharing it with us. How many cupcakes does it frost? Can I make this a day before and keep it in the fridge? How many cupcakes does this frost? I tried to make the buttercream frosting, and followed the instructions to the T. For some reason it curdled! It tasted really good, but looked awful. What could I have done wrong? This made perfect frosting for my granddaughter's fiesta birthday cake! I was glad that the whipping lightened it to almost white. Delicious! I have leftover and it's so delicious I don't want to waste. can it be frozen? What a great recipe ! It was easy to make & it turned out delicious and fluffy. Easy to work with also. Can i use thick cream instead of heavy cream? So nice and easy and turns out perfect every time! Tried it out. Works beautifully! I’m not sure what I am doing wrong. Followed the recipe exactly and my frosting came out sloppy and grainy. Tastes great but can’t be piped at all. How far does this recipe go?? E.g. top of cake only. Top and sides? Or gow mnay cupcakes?? Trying to plan ingrediants purchase. Can i make the icing and have it stored in fridge to ice cake later?? Will this be enough for 24 cupcakes? How much frosting does this make? Why didn't my frosting cone out thick, fluffy and white? Hi, I was wondering if you know how many cups of frosting this recipe makes? How many cupcakes can I do with this recipe? Just whipped up a batch! Delicious, so much sugar! Yummy! We’ll see how the girls at work like it! Put it on homemade chocolate cake! Is this frosting safe to be kept out of the refrigerator? How many cupcakes would this recipe cover? I am piping it onto 24 cupcakes. Should I double it? Triple? This is the Best icing ever!!!! I used this recipe for my sons 5th birthday cake and it was superb! If you follow her directions, you won’t go wrong. I’m planning on using this recipe for a Ressurrection cake for Easter. Thanks! Best buttercream frosting I have ever made it is my goto buttercream plus any unused freezes wonderful for flavoring I use cinnamon bark oil, peppermint oil,orange oil,tangerine oil,lemon oil. Best buttercream frosting I have ever made. I USE Irish butter in place of regular butter. It is my goto buttercream plus any unused freezes wonderful for flavoring I use cinnamon bark oil, peppermint oil,orange oil,tangerine oil,lemon oil. I just made this, it turned out wonderful. Will do do well with color? I'm putting this on pur 4th of July cupcakes and man did it turn out great! Not too sweet and very fluffy and white stiff. Exactly what I wanted!